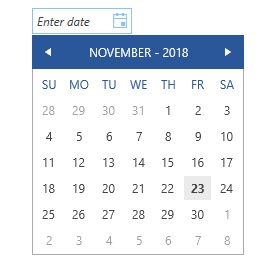 The purpose of this article is to demonstrate how the week numbers in the RadCalendar part inside the drop down of a RadDateTimePicker can be hidden. The final step is to create a RadDateTimePicker control and set CalendarStyle to the Style that you created. Please, pay attention that if the InputMode is set to TimePicker, the CalendarStyle will take no effect on the control.